A greater number of people in the present-day world begins to care of their health. And as we live in age of high technologies and technical progress, interest to the question about technogenetics factors influencing on a human health grows up. One of the technogenetics factors, influencing on a man health, is the wide use of different electronic technique. Indeed, to present nowday life without a television set, a computer or mobile phone is really difficult. But how do these blessings of civilization influence on us? 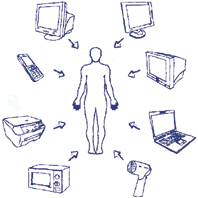 It is considered that electromagnetic fields, radiated by the monitors of personal computers, television sets, mobile phones, cordless phones and other electronic technique interferes the health of man. However last years researches showed that, except of an electromagnetic radiation, there are, as well, the torsion fields, which often named information fields (the most known researchers in this area are G.Shipov, A.Akimov, A.Bobrov, V.Kaznacheev, А.Pavlenko). It is experimentally determined that electromagnetic radiations have torsion (information) component. In spite of all achievements, modern pharmacological medicine is unable to win over or substantially reduce occurrence of some kind diseases, in this situation interest to untraditional medicine grows up. In east medicine the health of man means as a harmony of three bodies: physical, energetical (biofield) and informative. Illnesses of physical body means as a result of changes in informative and energetical bodies. Torsion (information) component of electromagnetic radiations operates with the informative and energetical bodies of man, therefore we talk about energy-informative influence, energy-informative defence. Our company is engaged in research concerning influencing of the torsion fields on a human health. We develop methods for defence of man from negative influencing of the torsion fields already more than 15 years. According to our researches (in which exept the specialists of our firm also took part specialists from France, Russia, Switzerland) in a number of cases exactly the torsion (instead of electromagnetic) fields are the basic factor of the negative influencing on a health of man.